Posted on Wednesday, January 16th, 2019 in Guides, Wedding Bands. Like shopping for an engagement ring, there are a lot of things to consider when picking out or creating the perfect wedding band. The options are endless when it comes to designing a wedding band, but here are some of the most important things to think about when shopping for wedding bands. Metal Type: There are a lot of choices available when it comes to selecting the metal type for your wedding band. Some couples select the same metal for their wedding bands while others decide to go different routes based on their personal preferences. The more traditional precious metal options include platinum, white gold, yellow gold, and rose gold while some of the more contemporary options include stainless steel and tungsten. Each metal has its benefits and drawbacks. For more information on the different metal options for your wedding band, click here. Weight: Typically, wedding bands come in three weights: light, medium, and heavy. More metal is required for heavy bands, so these rings will cost more than lightweight bands. But the additional cost may be worth it. These wedding bands are more durable and less prone to cracking and bending compared to lightweight bands. Also, many people like the feel of a heavy wedding band because it feels like they’re wearing something of importance. On the other hand, others prefer the feel of lightweight wedding bands because it feels like they aren’t wearing anything. Whatever your opinion might be, you should try on different weights before ordering your wedding band. Width: The width of a wedding band refers to the amount of space that the ring takes up on one’s finger. The majority of men choose to select a wedding band that is 5-8mm wide while the majority of women tend to select a wedding band that is 2-4mm wide. It all depends on the style you’re after and what looks and feels best on your finger. It’s always a smart idea to try on different widths to determine which one is most suitable for you. Comfort Fit vs. Standard Fit: These terms refer to the two types of ring sizing systems. The biggest difference between comfort fit wedding bands and standard fit wedding bands is how they feel when worn. 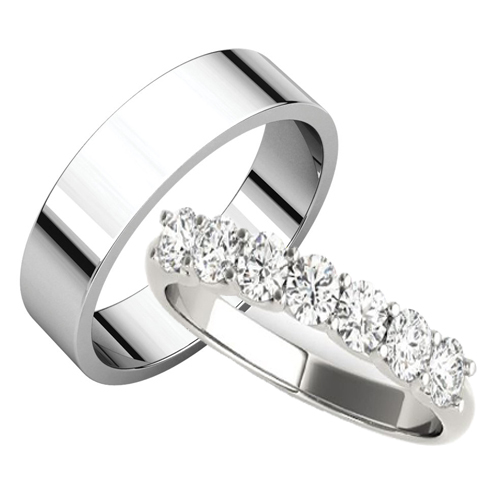 As the name implies, comfort fit wedding bands are believed to be more comfortable. But this comfort comes at an additional cost. You can find out more information about these different types of wedding bands here. Gemstones: One of the biggest style options you’ll consider when picking out wedding bands is whether or not you want to incorporate any gemstones in the ring. Many brides-to-be like select a diamond band to complement their engagement ring (engagement rings often come with matching wedding bands), but there are other gemstone options as well. Sapphires, rubies, and emeralds are all excellent options for those who prefer a little more color in their jewelry. While many grooms-to-be tend to stick with a plain wedding band, there are many style options that incorporate gemstones for those who want something a little different than everyone else. And for those who want that unique look without any gemstones, there are many finishing options available that can make your wedding band appear one-of-a-kind. Ring Size: It’s important to determine your accurate ring size before ordering a wedding band. Ordering a band that is too small or too large can mean additional costs, which is something many couples try to avoid when budgeting for a wedding. Ring sizing is especially important if you’re considering selecting an eternity band (a wedding band with gemstones surrounding the entire ring), as these rings cannot be resized. You can determine your ring size by visiting any reputable jewelry store. If you’d like to schedule an appointment to look at wedding bands or have any additional questions regarding wedding bands, contact Kloiber Jewelers at 414-276-2457 or info@kloiberjewelers.com.